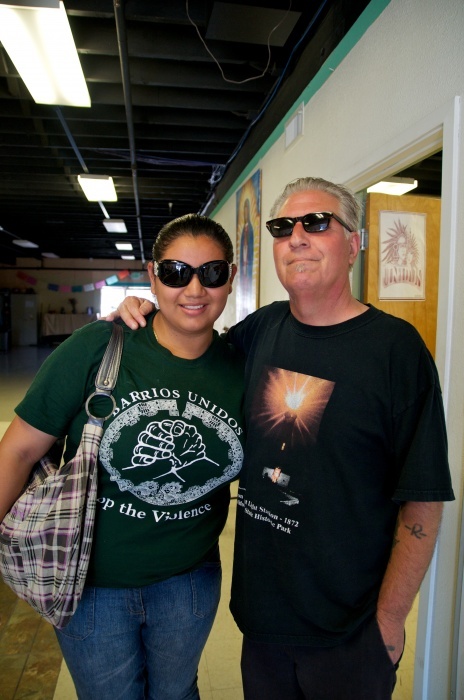 Recovered heroin addict and former gang member David Beaudry (right) works with street outreach at Barrios Unidos. Youth advocate Maria Montoya (left), 16, helps with BU's kids' club. Photo by Alex Zamora. Speaking from his Santa Cruz office, Alejandrez tells the story of Barrios Unidos (BU) and the thousands of men and women whose lives it has changed. The organization is devoted to preventing youth violence by providing young people with alternative opportunities to survive and succeed. These firsthand experiences with violence had a strong effect on Alejandrez, and he struggled to cope with them. 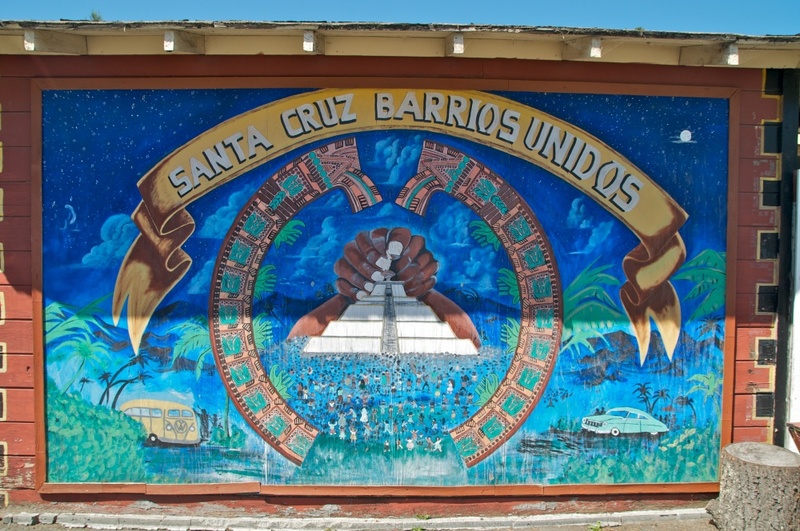 After the war he returned to Santa Cruz addicted to heroin and battled his addictions as he began doing peace work with Barrios Unidos, which means “united neighborhoods” in Spanish. Alejandrez graduated from UCSC with honors and turned down offers to join the staff of the Stanford University film department and the Mexican-American public administration in San José to continue the BU work he had started as a student. Though he had come to be regarded highly as an authority on the subject of ending gang violence, Alejandrez did not know how to give up drugs, he said. Now 23 years sober, Alejandrez credits a close friend, Walter Guzmán, with drawing him back to sobriety. Like Alejandrez, Guzmán had personal experience with gang violence and drug addiction. In the process of his own recovery, Guzmán found his calling as a substance abuse and youth counselor, eventually starting a seperate culturally-centered substance abuse recovery program and serving as the first board president of BU. Guzmán died in 2000, but he left a strong impact on Alejandrez and BU. Alejandrez remembers the powerful impact of being presented with the sobriety of someone to whom he could relate — a friend, who had encountered similar obstacles and experiences in his life. Alejandrez credits his recovery to Guzmán. “Walter was the first [sober] person I respected,” he said. Though he’d given up violence when he founded BU in 1977, it was only after Alejandrez kicked his drug habit that was he able to become the sober, nonviolent role model Santa Cruz youth would look to. Responding to the need for culture and family unity, the organization’s core mission became restoring local youth with spiritual and cultural rituals and counseling. Much of the faith-based work is grounded in Native American traditions, passed on by community elders and used to unite young people with a positive form of community. “We have to give them a cultural and spiritual grounding so that they know who they are, they know where they come from,” Alejandrez said. Clean and sober, Alejandrez was ready to take BU to the next level: spreading the group’s philosophy across the state, country and eventually the world. Alejandrez began to work with the United Nations and traveled on a peace delegation to Libya, a trip which was followed by work with the U.N. in Switzerland and peace work in Nicaragua and El Salvador. In addition to doing international work, BU began to grow in the U.S. Alejandrez and the other members incorporated BU, formed a governing board, built a staff and began applying for grants. Nine BU chapters were formed across the state, and the group drew the attention and support of public figures like Danny Glover, Carlos Santana and Henry Belefonte. BU’s services were in demand as juvenile violence in California began to increase in 1985, according to the National Center for Juvenile Justice. When volunteer Diana Sanchez visited the BU offices before she joined, she saw an exhibition of artwork from the inmates and immediately felt a connection. Photo by Alex Zamora. Now in its 33rd year, BU continues to focus on ending violence and crime among the youth of Santa Cruz County as an alternative to incarceration. With projects ranging from prison and juvenile hall programs to a T-shirt shop and a young fathers’ group, BU aims to end the cycle of violence at every stage, including working with prisoners. “A lot of fear is created around gangs and the prison community, but do they focus on the people who are changing their lives? No,” said Angie Espinoza, third-year community studies major and volunteer at BU. Alejandrez attributed some of the recent increase in gang activity in Santa Cruz to a failure to invest in violence prevention in the past. Diana Sanchez and Brenda Garibay visit the Santa Cruz juvenile detention facility three times a week doing outreach work with BU. Both women are strongly invested in their work, in part because of their own experiences with drugs and violence. Sanchez remembers visiting the BU offices before she joined. 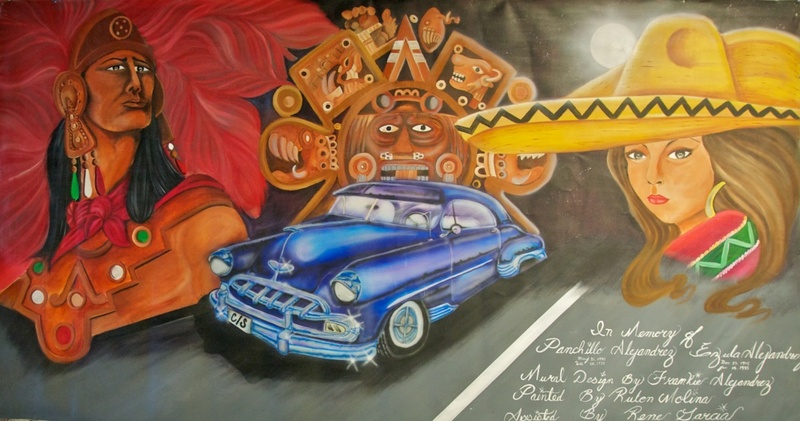 The group was exhibiting art from San Quentin inmates, and Sanchez instantly felt like she belonged. Garibay, a recent UCSC graduate, joined BU shortly after she left school. She found that working with the BU kids’ club fit well with her interests in education and in improving the lives of the children in her hometown. Garibay encourages youth to look beyond the present and see that they have a future, she said. In addition to organizing games and events that celebrate the inmates’ cultural diversity, the women do one-on-one check-ins with the kids. The women also lead groups in a program called Rule of Law (ROL), which educates inmates about social justice and how they can work with the law instead of fighting, running or lying. Garibay and Sanchez recalled a recent visit to the Sacramento juvenile detention facility, where BU will soon be working with the incarcerated youth. Espinoza recently attended her second Cinco de Mayo festival, a part of BU’s prison outreach program, in the Tracy city prison, where she saw firsthand the importance of working with inmates to help them reenter the community. BU began the prison outreach project, which includes classes for inmates and cultural ceremonies organized by inmates, in 1994. One of the core beliefs behind BU’s prison project is giving men and women in prison new opportunities. “Organizations like ourselves and others that go [to prisons] gives [prisoners] a connection to the outside, a feeling that they’re not left alone, that they might have an opportunity to return to their communities and be part of a society,” he said. While at the celebration, Espinoza watched men who had been incarcerated for years get excited at the prospect of having a job upon their parole. This is essential to getting and staying out of prison, she said. In the 16 years since the inception of the prison outreach program, members of BU have spent a lot of time and effort attacking the problems of violence that they see being cultivated in the prison systems. Alejandrez has seen the results of their work with the men in Tracy prison, he said. The Prison Project extends beyond the Cinco de Mayo celebration BU and the prisoners hold. The BU staff has turned to the organization’s roots on the UCSC campus to help provide the inmates educational opportunities. Angela Irvine, a research associate at the UCSC Center for Justice, Tolerance and Community and owner of Ceres Policy Research, was approached three years ago by Alejandrez and asked to teach in a vocational institute with UCSC professor John Brown Childs. Vocational education is designed to prepare trainees for jobs based on practical activities, which in this case provides prisoners with an alternative to gang membership and crime. Irvine has taught writing to men serving life sentences in the prison, and she laughs while confessing that she often jokingly exaggerates the danger of her job working with murderers. Although she does in fact work with men who have committed murder, the joke to her is that many people think working with these men is a frightening and dangerous job. Having spent years getting to know the inmates she works with, Irvine no longer thinks of the men as criminals to be feared, she said. Irvine explained that for most of the men a variety of sociological and personal reasons contributed to the murders they committed 20 or 30 years ago. Having been in prison for many years, the inmates she works with have become different people, people who have a very good understanding of the consequences of their actions, she said. “The men we work with are equal to or more skilled than people who are free because they are working so hard to become free,” she said. Irvine described her conviction that the men she worked with — not all inmates, but those whom she teaches — are no longer the same people they were when they committed the crimes that earned them life sentences years ago. Through the prison project many of them are given an opportunity to prove this, she said, and to stop the cycle of violence that landed them in prison.